This set of BT 2000 cordless phones from BT provides exceptional ease of use and a useful 'do not disturb' mode for those times when you don't want to be interrupted. With an outdoor range of up to 300 metres and an indoor range of up to 50, you can use the BT 2000 almost anywhere in your house or garden without having to worry about drops in signal strength. On a full battery, you'll have up to 12 hours of talk time and 120 hours on standby. The phone provides a 1.6" backlit screen to display caller numbers, up to 20 numbers to redial and more. The included phonebook provides space for up to 50 contacts which may be easily copied between handsets, and there are some useful extra applications, including an alarm, clock and call timer. With multiple handsets, you can also use the phone for internal calls and conference calls; great for teenagers that won’t leave their room. It also offers hands-free communication using the speakerphone, so you can talk while working or jotting things down. 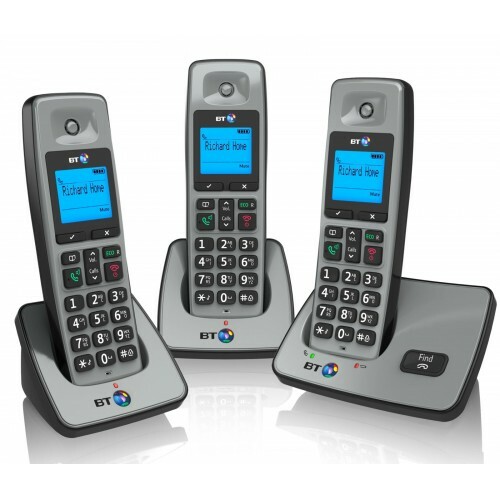 This set of three BT 2000 cordless phones is ideal for larger households or offices that demand affordability, ease of use and reliability. Great value for money, easy to setup, and work well. No worries! These phones are of decent quality....nothing too fancy, but do the job. sound quality is as great as i expected, but well, it meets my expectation for a solid home phone. easy to use as well.